Apply your transparent logo watermark to multiple image files. 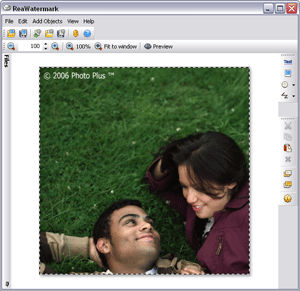 ReaWatermark simplifies the process of creating and applying watermarks to multiple files in multiple folders. It supports a mixture of text, copyright symbols, graphics and drawing watermarks of any complexity. The multi-level transparency setting allows you to choose and preview how your watermark image or text will affect the protected image. This watermark software will help you to apply transparent logo on images. Main features: Easy prove your copyright with 100 transparency levels, One step to process large number of photos of variable size and orientation in multiple folders, Copyright and registered symbols support, Batch converting, Intuitive and easy-to-use interface.